GENRE: AMISH ROMANCEPUBLISHER: BALLANTINE BOOKSPUBLICATION DATE: OCTOBER 16, 2012 RATING: 3.5 OUT OF 5 – GOODPROS: Good conclusion to the series; characters displayed realistic emotions; relaxing, easy read; accurate depiction of the Amish and of Lancaster CountyCONS: Gabe’s conflict seemed to be wrapped up too quickly; plot not as compelling as previous two books in series; readers will appreciate this book more having read the rest of the seriesWith their older brother and sister making preparations to get married this autumn, this makes Jonah and Gabe the oldest unmarried children still living on the King family farm. Jonah is well beyond the typical age for settling down, and starting to wonder if he’ll ever have a family of his own. He’s long had his eye on Annie Stoltzfus, who won’t even look his way after being spurned by Jonah’s brother, Adam. But Jonah isn’t ready to give up yet. When it becomes clear that Annie’s father needs extra help on his farm, Jonah volunteers his services in the hope that he can spend more time with Annie. But is Annie too concerned with her own problems to notice Jonah’s attentions? With one sister moving to New York, and another turning eighteen and worrying about her lack of beau, Annie is too focused on the changes in her life and trying to find someone for Hannah to court to notice the new young man in her life. When Annie starts talking about moving to New York to live with her older sister, Jonah realises time is running out. Will he ever be confident enough to tell Annie how he truly feels?Gabe is not so focused on joining the church and starting a family, although he has no intention to become English, like his sister, Sadie. He’s secretly courting the schoolteacher, Emma Lapp, and can’t help but wish she’d allow their relationship to become public, at least with their family and friends. But Emma is determined to make a good impression on her students and is worried about Gabe’s dabbling in the English world. Even if he claims he doesn’t want to leave the faith, he’s yet to get baptised and enjoys trying things that he knows are forbidden under the Ordnung. The final straw comes for Emma when Gabe chooses riding motorcycles with his English friend over having dinner with her parents. Is their relationship truly over? Or will Gabe realise that he gave up something lasting for a temporary fix?With the Amish Fiction market as saturated as it is, sometimes it’s hard to keep up with your old favourite authors and still try new ones. But I was prompted to purchase Rosalind’s first novel earlier this year because of how unusual the plot sounded. A Simple Winter focused on a female reporter who ended up falling in love with an Amish man while trying to investigate the murder of his parents. The mystery surrounding the deaths of the King parents intrigued me, and Remy and Adam’s love story wasn’t as predictable as some English-Amish relationships can be in romance novels. A Simple Spring, the second novel in the series, was just as unconventional, focusing on Adam’s younger sister’s decision to become a singer in the English world. I loved how honestly Rosalind displayed a family and community’s reaction to an unbaptized member leaving the faith and Sadie’s conflict over whether she should stay Amish and deny her natural talent for music. Naturally, after loving both of these books, I had to read A Simple Autumn. As a conclusion to the series, I felt A Simple Autumn wrapped up previous storylines fairly well. Fans of the series will be pleased to finally get the chance to witness Adam and Remy’s wedding and see how Remy has adapted to life in the Amish faith. We get a little glimpse of Sadie when she comes to visit, but are reminded of how difficult it is for her family to adapt to Sadie becoming English. Ultimately, although I appreciated the way that this book wrapped up earlier storylines, I wished the series would continue and tell the stories of the other King siblings. In particular, I’d love to see Leah and Susie’s personalities developed further, particularly with Leah’s desire to learn and Susie’s illness. As a story in its own right, A Simple Autumn is more of a standard romance novel than previous books in the Seasons of Lancaster series. I don’t think either Jonah or Gabe’s stories could have filled a whole novel, so it was quite interesting to have them pitted against each other. As much as I enjoy sweet, Amish romances, I did find myself wishing for something more like the first two books in the series, either the mystery aspect of A Simple Winter or just the pitting of the Amish and English worlds against each other, as occurred in both the first and second books in the series. As for the romances themselves, I did enjoy reading about Jonah and Gabe finding love. I got frustrated with how often Jonah was referred to as The Quiet One and how he felt constrained by this personality trait, so I was pleased when he finally decided to talk to both Hannah and Annie about his feelings. The part of the storyline that focused on Annie matchmaking Jonah and Hannah and her being oblivious to Jonah’s attentions was predictable, but amusing. I could see why she’d struggle to imagine a relationship with Jonah, given how much he reminded her of his older brother, who had rejected her previously. When Annie and Jonah did finally talk about their feelings, their conversations were very honest. Their love story might not have been the most exciting one I’ve read, but their emotions felt very realistic. I could empathise with Annie’s yearning to get married and have a family of her own, and feeling left behind when all of her friends were pairing up together. I’m sure a lot of women can understand her desire for love.Gabe and Emma are the younger of the two couples, and as such, their conflict felt a bit more immature. Initially I was annoyed at Emma for being ashamed of Gabe because of his rebellious nature, but when he chose motorbiking over meeting her parents, I was immediately on Emma’s side. I loved how Rosalind was able to flip my emotions between Emma and Gabe and make me empathise with both sides of their conflict. Ultimately, I was pleased with the outcome of the situation and the growth each character made over the course of the book, but I did feel that their conflict was wrapped up rather quickly. Gabe had a moment in which he experienced a sort of revelation about his life, and this seemed to cause him to completely rethink his love of motorbikes and his relationship with Emma. It didn’t feel terribly realistic to have that sort of change occur so suddenly, and perhaps it could have been drawn out more.Ultimately, it’s hard to describe my feelings about A Simple Autumn. In its own right, the novel is a relaxing, sweet romance novel that contains plenty of wonderful descriptions of the scenery in Lancaster County and accurate details about Amish life. But as part of the Seasons of Lancaster series, I felt this was the weakest of the three novels. It did provide a satisfying conclusion to the series, with Adam and Remy’s wedding and Sadie’s visit, but the conflicts the characters had to overcome were much smaller by comparison. I did come to care about each of the characters, but I worry that this is the sort of novel that might become buried under numerous other Amish romances, given the conventionality of the story. I do highly recommend the Seasons of Lancaster series to readers of Amish Fiction, but I believe new readers would appreciate this novel more if they started at the beginning of the series. Review title provided by Ballantine Books. The perfect endingThe third book in this series was a bit long. Probably because I couldn't put it down and was anxious to see how it ended! Rosalind Lauer is by far my favorite author of Amish books. The King family has had a rough time trying to raise a family in the Amish community. Their parents were murdered leaving a large family to find ways to work together. At first, like most Amish communities, whenever there is loss, they rally around and help one another, which they did at first. But over time as the oldest children Adam and Mary grew, they realized they could all work together as one to provide for one another. Adam the oldest son is being looked out through the eyes of the community because he has chosen an Englischer for his soon-to-be wife Remy McCallister. However Remy is a bit different because she wants to learn the Amish ways and works hard to become baptized in the church. Yet it doesn't stop people from whispering and judging them against the old Amish ways of the church.For Annie Stoltzfus it is extremely difficult to come to terms with because her whole life, she dreamed of marrying Adam. Thinking she stood a great chance at becoming his wife, she never dreamed he would find love outside their community of believers and worse yet, bring her home to become part of the church. Annie now 20, wonders if she will ever find love or will she grow to become an old maid, raising the rest of her siblings and watching them leave and start family's of their own.Jonah King loves Annie more than he ever thought possible only she doesn't seem to know he exists outside of being simply Adam's younger brother. Even though he spends as much time as he can helping her father out on the farm since needing additional help, he had hoped to find a way to let her know just how he felt. But it seems all Annie can notice is that her younger sister Hannah, would make a perfect wife for Jonah and spends all her time trying to play matchmaker. Will she ever learn just how close love is right in front of her?In the novel, A Simple Autumn by Rosalind Lauer, we are drawn back to Lancaster County as two brothers in the King family try to find love as they battle their own personal feelings with conflicts with the women they love. For the younger brother, Gabe, he is spending his Rumspringa riding motorbikes until he feels called to the church. But when the local school teacher, Emma learns that he is doing things that go against the church, it may cost him the love of his life when Emma decides she isn't going to wait for Gabe to make a choice between her or his love of motorcycling riding? Either way it may just kill him if he isn't careful.I received A Simple Autumn compliments of Random House Publishing Group and Net Galley for my honest review. Even though this title isn't available until the fall this year, I've been blessed with the opportunity to review it now and I can't wait for you to pick this one up for a great fall read while watching the colored leaves fall from the trees, to sit back on a crisp night and sit next to the fire for some great Christian romance! I rate this one a 5 out of 5 stars and just know if you're a fan of Amish Fiction, you'll definitely want to make a note to pick this one up or pre-order it now. While you're waiting, you can pick up A Simple Winter and A Simple Spring now, and get to know more about the people in Lancaster County. Title: A SIMPLE AUTUMNAuthor: Rosalind LauerPublisher: Ballantine BooksOctober 2012ISBN: 978-0345526755Genre: AmishA LOVE THAT REMAINS HIDDEN,A FORK IN A THORNY ROADJonah King has no desire to leave his close-knit community. All his hopes and dreams lie in Lancaster County, and many of them revolve around his longtime love for Annie Stoltzfus. For years he’s been trying to get her to see what burns inside his heart, yet he remains all but invisible to her. Annie’s beautiful eyes reflect only her affection for Jonah’s older brother—and her sadness when he chooses another. Jonah knows that he must speak up, but when he’s around Annie his calm, capable demeanor flees, leaving him tongue-twisted and awkward.Gabe King has been courting schoolteacher Emma Lapp for months, but she insists on keeping their relationship secret. Emma embraces her duty to set a good example for her pupils, but Gabe is in his rumspringa and still wild at heart, riding motorbikes and unwilling to cut his ties to the outside world. Much to Emma’s deep sorrow, it appears that she and Gabe are choosing different paths.As swirling leaves of orange and gold dance across the countryside, two brothers must find the courage and faith to reconcile their heritage and their hearts.A SIMPLE AUTUMN is the third book in the Seasons of Lancaster series. I didn’t read the first two books in the series, but would recommend that others do, as it seemed to refer back to the previous two books, A Simple Winter and A Simple Spring. I can’t say I really enjoyed A SIMPLE AUTUMN. The point of view was distant, and I never connected with the characters. The Story also dragged. Plus Annie really acts immature when Jonah accidentally bumps her at a volleyball game. 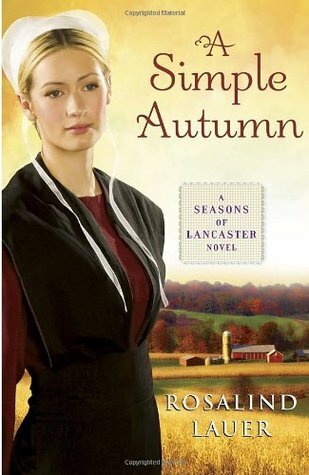 If you like Amish fiction, no matter what, then my might want to read A SIMPLE AUTUMN or A Seasons of Lancaster series. If you want a story that will draw you in and make you care, this isn’t it. $15.00. 400 pages. 3 stars. This book is about a four star but not quite. I did not read the first 2 books in the series; maybe if I had I would have liked it more. It was a standalone book, in other words you can read it without the other 2 but it leaves you wanting the back story of the King family.There is a great moral to the book that of finding love in the ones around you. I this case Annie Stoltzus has always loved one brother, who left the Amish community, came back when his parents were murdered but not for Annie, he brought an Englisher with him. Annie cannot see what a great catch Jonah King is; he is just someone in the background to her. As he helps out at her family farm because her father is weak then succumbs to a heart attack. Jonah has loved Annie all their lives, watching her from afar while is school. He hopes that helping out on her farm will open her eyes to the wonderful guy he is. Then to Jonah's dismay she decides to move to New York to live with her sister. What can he do, he will never love another.At the same time the wild brother Gabe King is secretly courting the School Teacher Emma Lapp. She has to keep a high moral standard and the embarrassment of the King family, a brother marrying a convert from the outside world and a sister who left the Amish community to sing, may come between her and her love. Gabe will not settle down, he would rather ride dirt bikes than keep the high moral standard that Emma feels he must. Emma has to break up with Gabe to keep her teaching position, or so she feels, bringing heartache to her and Gabe both.What will become of these two couples? Will they ever find true happiness together? Read the book to find out, I won't give it away.I am a huge fan of Amish Fiction and read every book I can find. I liked this book but not as much as my favorite authors Beverly Lewis of Beth Wiseman. I would recommend this book for those who love Amish fiction as I do it keeps you wondering with all its twists and turns. I just didn't find it to be the "I can’t put it down book" I read from other authors. The third book in The Seasons of Lancaster County Series, this book follows the story of the King family. Jonah King, also known as the Quiet One, is learning how to express himself and talk about how he feels. His love for Annie hasn't diminished over the years, even though she never knew it.At the same time Gabe King is wanting the best of both worlds. Still in his rumspringa, running around years, he enjoys riding on motorbikes. His love for Elsie is also growing stronger and he wants to marry her. He doesn't plan to leave the faith, but he is not ready to give up the motorbikes.Many times Amish stories seem similar. Some stories seem to go a bit farther and stretch what would really happen in an Amish home. But this book takes the reader into the home of an Amish family. You see the struggles and the joys of each choice that is made, each day that goes by. I enjoyed following the King family in this book.------I received this complementary E-book from Edelweiss in return for my honest review. This book is part of the series called Seasons of Lancaster. You do not have to read the others to enjoy this book. This story is about two brothers and one girl. The girl has to decide which brother best fits with what she wants for her life. Will she choose the brother who always gets her attention or wills he finally notice the brother who is always there for her?I gave this book 4/5 stars. The story was a little slow. I have read many Christian Fiction Amish books so I was hoping this would be as good as the others. The story was believable but the plot took awhile to move along. The characters also were not that enjoyable. You just did not really want to pull for any of them! That said if you like stories set in the Amish community you will probably enjoy this book.I would like to thank NetGalley and the publisher for the copy of this book I enjoyed reading. I gave an honest review based on my opinion of what I read. I read this for work, as we are challenged to read a couple of books outside our comfort zone. I found it excruciatingly slow and painfully repeptitive. I don't think it was necessary to repeat half a dozen times that Remy won't ever fit in due to her flaming hair.Annie was described (by Jonah) several times near the beginning of the book as feisty, but I never really saw any evidence of that sort of nature in her actions. Her entire ambition in life was to have a baby. Some pretty tired plot devices threw her together with the man (handsome, good with kids, hard worker..check!) she fell in love with so her dreams could come true. Annie was so disappointed when Adam decided to marry someone else. Johan his brother had loved Annie for years, but too shy to tell her. She never took him serious. Even tired to set up her sister with him. When Johan finally told her of his love, she couldn't accept it. But yet Johan wouldn't take no for an answer. She even planned to move away from her family. But it took a family emergency for those plans to chance and in the process to find out that there were feeling for Johan.Enjoyed reading about Amish weddings. Something amazing. I didn't love this nearly as much as the other two books. Annie and Emma were just not as interesting or likeable as Remy and Sadie, and I didn't feel the romance between Annie and Jonah or Emma and Gabe at all. (view spoiler)[I truly feel like Annie just settled for Jonah so she could finally get married, and I don't buy that Gabe gave up motorcycles from one glimpse of Adam's horse. Come on now. (hide spoiler)]As a conclusion to the series it was pretty good, but as a story in its own right it didn't really work for me. I still loved this series overall, though. meh.The writing was so boring - as if she just jotted down the plot without thinking to hard about it.The romances were fairly dry, and slightly unrealistic. If a boy is told no often enough, for heavens sake he'll let it go. And you think a guy in love with motorbikes is just going to one day see a man on a horse and think, "What was I thinking? Now THAT's a man." Right.I didn't even bother with the final 2 chapters.So, meh - C+? This really should have been a youth novel. I would have rated it higher if they had. It was filled with benign dialog, which was painful to wade through. It was so pollyanna...I really expected there to be unicorns frolicking in the amish fields under big bright rainbows. I don't mean to be mean or hateful....all I am saying is that if you really want to read a great book....this is not it. I usually like amish fiction...but this was just so juvenile. This definitely had some twists and turns to it, right up to the very end, so you never knew quite what was going to end up happening with the King brothers and the women they loved. That said, though the ride was winding, it was definitely worth the while. I appreciated the lessons about blooming where you're planted, and how the wisdom of loved ones lives on even after they've passed from this life. A very fitting end to this series. Sparks do not fly when Jonah and Gabe fall for two women in their Amish community. Author Rosalind Lauer, discusses whether it is a question of faith or a question of love, that impedes relationships. A predictable ending to a nice story. These books are filled with good, loving people, they make you feel good, but in my opinion they are not as good as other Amish fiction. The story is predictable, a little intrigue or mystery would be nice. Good book to end series. Another nice edition to the series! I'm still shocked that I like anything bordering on Christian romance, genre-wise, but it's such a break from things I usually read. Excellent!! A great sequel to the others in the series. Very much enjoyed this 3rd book in the series "A Seasonsof Lancaster" . Looking forward to more books by Rosalind Lauer. I am enjoying this series of books. It is nice to read a good book that talks about love and God. You will learn about the Amish culture while reading this series. Rosalind Lauer - Rosalind Lauer grew up in a large family in Maryland and began visiting Lancaster County’s Amish community as a child. Lauer attended Wagner College in New York City and worked as an editor for Simon & Schuster and Harlequin Books. She now lives with her family in Oregon, where she writes in the shade of some towering two-hundred-year-old Douglas fir trees.